On 8th October last year, leftist propaganda website, ‘The Wire’ had published an article alleging impropriety in business dealings, of the BJP President’s son Jay Shah. Their article, which was riddled with glaring loopholes and inaccuracy, was decimated by us. Subsequently, The Wire had selectively altered its story, but the shaky ground on which the story stood remained thus. On October 12th, in response to the shoddy story, Jay Shah had slapped ‘The Wire’ with a Rs. 100 crore defamation case. What followed was, of course, the usual rhetoric of press freedom being muzzled and how the BJP, which was a “fascist regime” wanted to keep the “truth” under wraps. The leftists seem to use the word “truth” fast and loose since what was published in ‘The Wire’ could be called a shaky hitjob which was executed in the worst, and the most infantile manner. On 12th October itself, BK Dasondi, 4th Additional Senior Civil Judge, Ahmedabad Rural, had passed an ex parte order preventing The Wire from publishing anything, in any form, related to the article dated October 8. ‘The Wire’ had approached the High Court thereafter, appealing against the gag order, and while throwing their appeal out, the High Court had made some scathing comments. The High Court also essentially told team Wire, that if they wanted to appeal against the ex parte injunction, they should have approached the Trial Court that passed it and not the Hight Court. When team Wire approached the Trial Court subsequently, the gag order, in essence, was squashed with the caveat that the portal couldn’t publish anything that dragged in Prime Minister Narendra Modi’s name into the entire controversy. After the Trial Court order, Jay Shah approached the High Court appealing against the trial court order that vacated the injunction and the High Court had reserved its verdict for 19th January 2018. The High Court found that there was no reason for the Trial Court to dilute its previous order granting the injunction to Jay Shah and effectively gagging ‘The Wire’ from publishing anything related to the matter. In the course of the verdict, however, Gujarat High Court made some interesting observations. Justice Upadhyay went on to consider the three prerequisites for granting an injunction: a prima facie case, the balance of convenience, and irreparable loss caused to one of the parties. In Paragraph 6.5 of the judgement, the High Court observed that the Trial Court had found that the plaintiff (Jay Shah) does have a prima facie case even before hearing the defendants and hence had granted the injunction. The Trial Court, even after hearing the defendants (team Wire) had maintained that Jay Shah had a prima facie case, and thus, the High Court also held that a prima facie case exists. In lay terms, ‘prima facie’ basically means ‘at first sight’. In this case, the ‘burden of proof’ lies on Jay Shah, which is to say, it is he who has to prove that The Wire defamed him with their article. 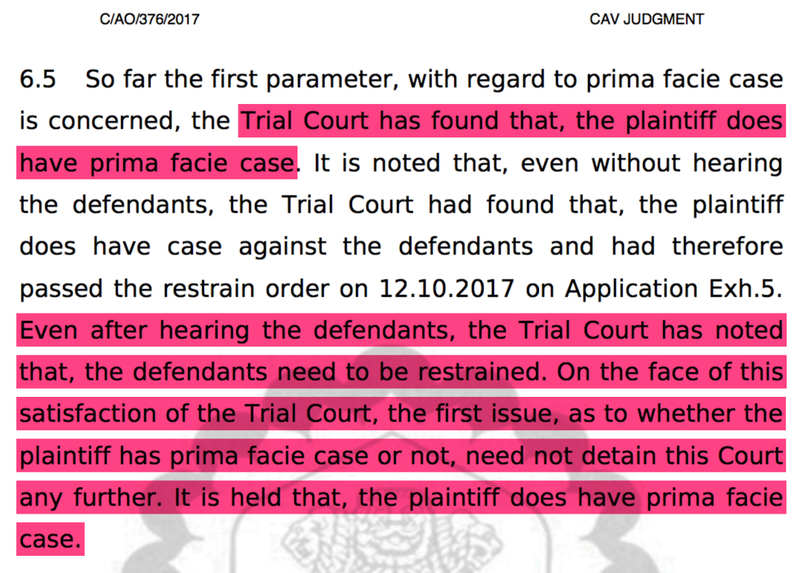 When the Court says that Jay Shah has a ‘prima facie’ case, it means that the case presented by Jay Shah’s counsel is sufficient for the court not to dismiss the case and for it to proceed to trial. For both these prerequisites, the High Court first observed (in Para 6.6) that the Trial Court had held in favour of the plaintiff. In lay terms, ‘Balance of convenience’ means that the court has to examine the balance of comparative loss caused to both parties in the case of not passing the order. ‘Balance of convenience’ in favour of the plaintiff (Jay Shah) would mean that Jay Shah would suffer losses that would far exceed the loss suffered by team Wire if the injunction (gag order) was not passed. The irreparable loss is, of course, a self-explanatory term that would mean that the High Court observed that if team Wire was allowed to write about Jay Shah, and if the injunction wasn’t granted, Jay Shah would suffer losses that would be irreparable. Interestingly, the High Court then concurred with the Trial Court’s observations that team Wire has failed to prove that there was any sort of nexus of the Prime Minister with the increase in the business of the Jay Shah’s company. More interestingly, the High Court agreed with the observation that team Wire has failed to prove that “following the election of Narendra Modi as Prime Minister, the plaintiff (Jay Shah) has flourished”. It would be worthy to note, that this was mostly the entire premise of ‘The Wire’s’ article authored by Rohini Singh. The High Court observed that considering the above observations, the Trial Court was right in granting injunction to Jay Shah initially, but “the Trial Court fell in error by restricting the relief in favour of the plaintiff (Jay Shah) to the limited extent of ‘referring to the name of Hon’ble the Prime Minister”. Repeating the observations of the Trial Court, the High Court observed that the initial restraining order dated 12.10.2017 was not required to be diluted by the trial court and the said gag order needs to be restored. 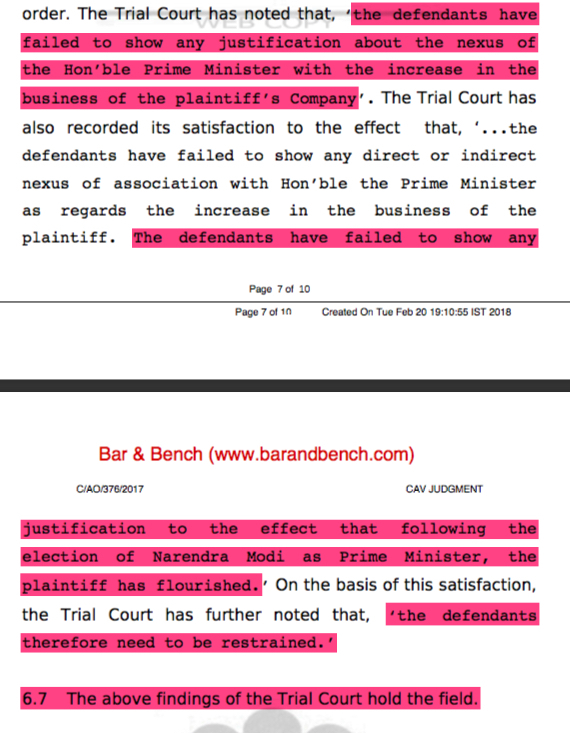 The court thus deleted the portion of the diluted injunction that read “…narrating the lines or words, in the manner of “since Narendra Modi became Prime Minister / following the election of Narendra Modi as Prime Minister”…” effectively restoring the original gag order that the Trial Court has diluted. Siddharth Varadarajan, the Founding Editor of ‘The Wire’ took to Twitter to drum up the same old victim card, question the wisdom of the court, and declare that they will challenge the High Court’s order in the Supreme Court. 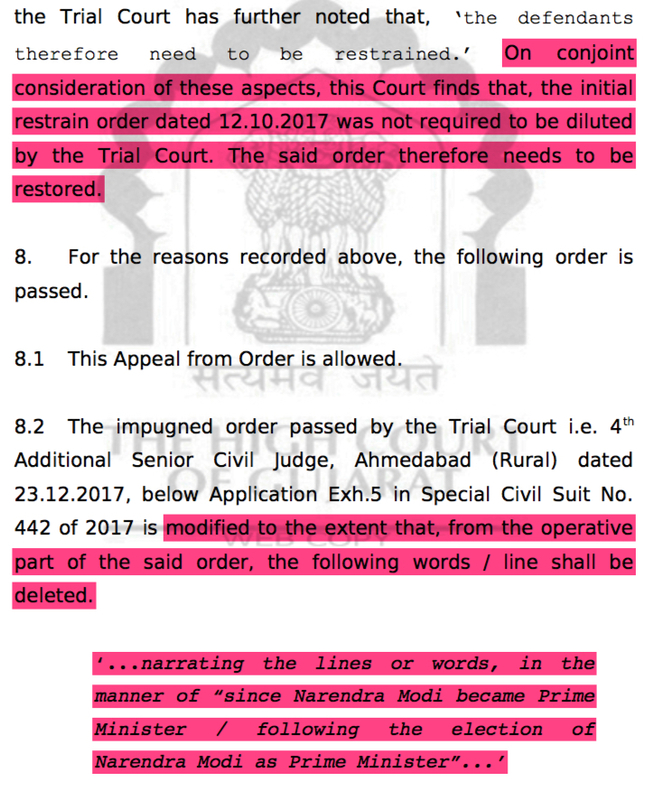 Going against several decades of jurisprudence, Gujarat HC has restored gag order that trial court itself vacated after first granting Jay Amit Shah ex parte injunction against @thewire_in. We will challenge this verdict, which affects media freedom for all, in the Supreme Court. It is perhaps safe to presume that Varadarajan doesn’t expect his readers to actually go through the HC verdict that seems clear on why the injunction has been granted. Three prerequisites, that are needed to be fulfilled by law, were deemed fulfilled, and hence the injunction was granted. Varadarajan also fails to inform his readers that the Trial Court, that had diluted the initial gag order had also concluded that ‘The Wire’ had failed to establish that after Narendra Modi became the Prime Minister, Jay Shah’s fortunes had risen, which was basically the entire premise of the article in question. Varadarajan, perhaps maliciously, doesn’t inform his readers, that while he had celebrated the Trial Court verdict, the Trial Court too had concluded that the three prerequisites; Prima facie case, balance of convenience, and irreparable loss, were in favour of Jay Shah and it is only the dilution of the injunction that has been reversed. While ‘The Wire’ resorts to deceit as a matter of habit, the Court, in its wisdom has retrained the portal from indulging in their usual ad hominem platitudes, at least in the Jay Shah matter.